KUALA LUMPUR, Malaysia, Mar 19 2019 (IPS) - With the Washington Consensus from the 1980s being challenged, President Donald Trump withdrawing the United States from the Trans-Pacific Partnership (TPP), and China pursuing its Belt and Road Initiative (BRI), most notably with its own initiatives such as the multilateral Asian Infrastructure Investment Bank (AIIB), the political and economic landscape in East Asia continues to evolve. 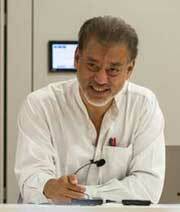 Jomo Kwame Sundaram was interviewed about likely implications for developing countries in the region and beyond. What do you think of world growth prospects and China’s Belt and Road Initiative? Although there are some hopeful signs here and there, there are few grounds for much optimism around the North Atlantic (US and Europe) for various reasons. Unconventional monetary policies, especially quantitative easing (QE), have helped achieve a modest recovery in the US, but appears less likely to succeed elsewhere. Such measures have also accelerated massive wealth concentration, which is why a few of the world’s richest men own more than the bottom half of the world’s population.